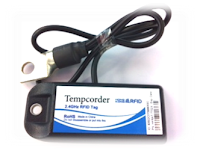 HK-RFID happily announces the addition of a new member to our 2.4GHz active RFID tag series - Tempcorder (model: HKRAT-TT02X). With its external probe feature, more flexibility is available to facilitate more creative usage of active RFID technology in temperature monitoring applications. Tempcorder TT02X can perform stably around metal, liquid and other RF unfriendly environment. With the external temperature probe, wider temperature data could be collected while RF transmission is not affected as the small and slim probe with temperature sensor can reach deep inside a metallic or water-filled box but the active RFID tag can remain uncovered by the metal or water content. 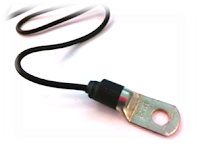 Thermocouple with customized mounting options is now also available per volume order request. Each system can use one type of sensor only.